I was provided with a HP Pavilion x360 Convertible Touchscreen laptop to put through its paces and review. I have decided to consider its use as a student- or school-owned notebook in a 1:1 environment in a middle or high school. I am a huge fan of the 13.3" form factor in a laptop, as this HP Pavilion x360 Convertible sports. With its 1920x1080 pixel resolution and the bright screen, it has enough screen real estate to work smartly with multiple windows open. The screen is also a touchscreen, which adds to the ease of use in notebook mode. And, with its beautiful gold color, it will definitely stand out in a crowd! I really love the convertible feature of the HP Pavilion x360 Convertible! The screen folds all the way back and becomes a Windows tablet! Windows 10 now includes an option to "turn on tablet" mode when the screen is folded back, so everything works great with a finger or stylus. In addition to folding all the way back on itself to to become a tablet, the 360° hinge allows others ways to use the HP Pavilion x360 Convertible -- for viewing and playing. It can easily be set-up in "viewing" (stand) mode and the screen can be shared with others while viewing online content, or the student can put it in "playing" (tent) mode to use touch to navigate through online games or interactive Web sites. With its Intel i5-6200U 2.3GHz Processor, 8GB of RAM, and 128GB solid state drive, the HP Pavilion x360 Convertible is virtually instant-on and off and is speedy to open programs, render videos, and surf the Web. The speakers are loud and clear and the inclusion of a wide-angle webcam, an SD slot, three USB ports (2 USB 3.0 and 1 USB 2.0), an HDMI port, an audio combo jack, a volume control on the edge of the laptop, a backlit keyboard, and an 8 hour battery life, the HP Pavilion x360 Convertible would make any student happy! I have a web page on my Kathy Schrock's Guide to Everything site that deals specifically with online creation tools. With the ability to work, save, and access projects in the cloud, students truly can get to their assets 24x7. 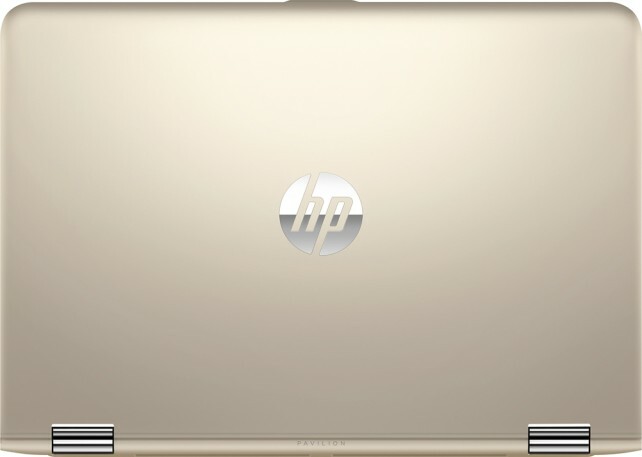 The HP Pavilion x360 Convertible, because of its specs, especially the multi-angled touchscreen, the long battery life, and speedy performance, is one laptop that really shines using online tools. In addition, by being a "real" laptop with ann SSD drive, students can easily have the gathered assets they need to pull into an online tool handy. I used the HP Pavilion x360 Convertible to create four projects, outlined below. Canva is an online desktop publishing tool. The number of graphics templates for a student's every need, as well as hundreds of built-in assets to use, makes Canva a perfect tool for creation of graphics for use in student projects, from blog posts to infographics. 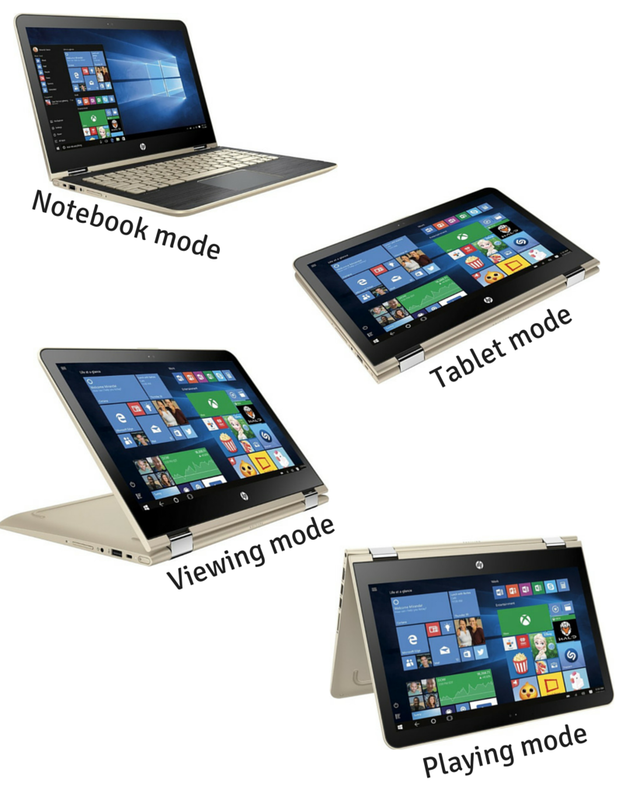 I used the HP Pavilion x360 Convertible in touchscreen tablet mode and Canva to create the image showcasing the four different modes of this laptop that you seen above. A Web Whiteboard (AWW) "is a touch friendly, online whiteboard that lets you use your computer, tablet, or smartphone to easily draw sketches, collaborate with others, and share them with the world." One of my current passions is teaching educators to work with students in the area of visual note-taking, also called sketchnoting. I have resources and links on this page. I decided to complete one of the activities I have teachers do in my sketchnoting workshop, using the touchscreen tablet mode of the HP Pavilion x360 Convertible and the online Awwapp tool. The exercise (learned from Mike Rohde's book) is to practice drawing faces, using only simple lines and dots. Below is my sketchnote. I used the Windows 10 Clipping Tool to take the screenshot. 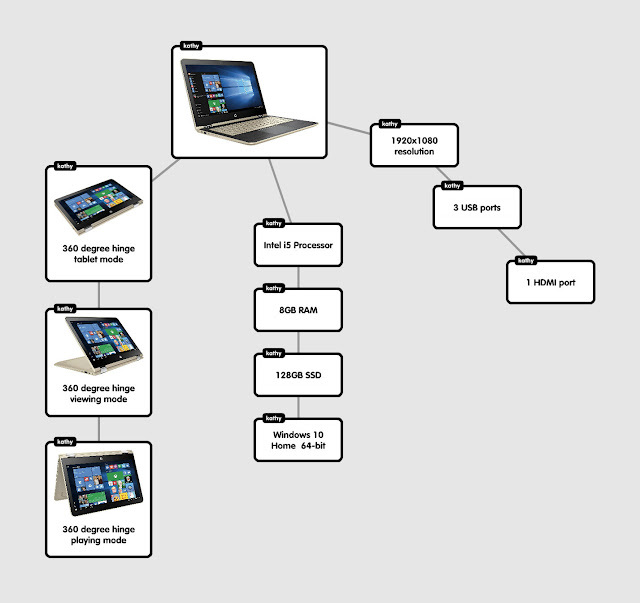 Popplet is available an an iPad app but is also available online. It is a mind-mapper which allows the inclusion of images and text. It can also be used as a storyboarding tool, a concept mapper, for the development of the parts of an essay, the outlining of the research cycle, character maps, and much more. I have additional information about mapping assessments and mapping tools on this page. Here is a Popplet I created using the HP Pavilion x360 Convertible in tablet mode. Although Videoscribe is not an online tool, I wanted to try out the Windows version of it. I usually use it on the Mac and it is one of my favorite tools! I used Videoscribe on the HP Pavilion x360 Convertible to create this little promo for the laptop! If you are looking for a reasonably-priced laptop that has many of the newest features, including a bright touchscreen, four modes of using, a great sound system, speedy performance, and a long battery life, check out the HP Pavilion x360 Convertible! This is a sponsored post on behalf HP and Best Buy.